The Shiv Sena and another Hindu organisation claimed to have forcibly shut around 400 meat and chicken shops at different locations here on Wednesday, demanding that they remain closed during Navaratri. Chief of Shiv Sena's Gurgaon unit Gautam Saini told PTI that around 300 members of different Hindu organisations assembled at the Lord Shiva temple located at the Old Railway road on Wednesday morning and headed to different places to close meat shops. forcibly shut down meat markets in Surat Nagar, Ashok Vihar, Sector 5 and 9, Pataudi Chowk, Jacobpura, Sadar Bazaar, Khandsa Anaj Mandi, Bus Stand, DLF area, Sohna and Sector 14. 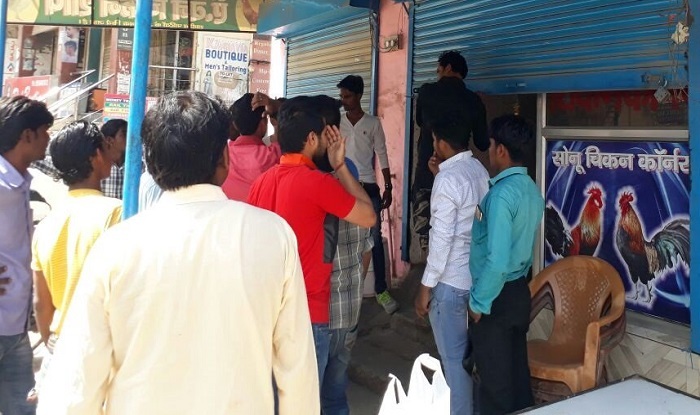 They said 50 per cent of the shops are already closed amid fears of clashes, State president of Hindu Sena Ritu Raj said, "The Hindu organizations will continue their effort throughout Navratri. The next target is new Gurgaon where there are a large number of meat shops." "We have arrested four leaders of Hindu organisations during the march. An FIR has been registered against them under relevant sections of the IPC for disturbing peace. Further investigation is underway," Gurgaon police PRO Subhash Bokan said.